The Santa Barbara Spanish Missions Section of the California Central Coast Travel Guide features Mission Santa Barbara ("Queen of the Missions"), Mission Santa Ines in Solvang and Lompoc's La Purisima Mission State Historic Park. These sites have been extensively restored, bringing alive the early history of California and are open to visitors. 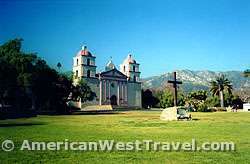 Mission Santa Barbara and Mission Santa Ines are also working churches. The missions feature beautiful buildings and furnishings, artwork and other artifacts from California's past. Mission Santa Barbara was the tenth mission founded, in 1786. Starting as log buildings with thatch roofs, the mission evolved into an adobe structure which was destroyed by an earthquake in 1812. It was rebuilt as a stone structure, eventually becoming the only mission with two towers, then destroyed in a 1925 quake, then rebuilt twice after that. Today, the main church and sanctuary appear as it did in 1820. Over the years, the mission has functioned as a high school, a junior college, and later, a seminary. It has been a museum since 1968. The church itself remains active as a place of worship. Much of Santa Barbara's beautiful artwork is from the baroque and neoclassical eras, imported primarily from Mexico and South America. However there are several notable stone statues carved by a mission Indian. The church architecture is similar to many built in early 19th century Mexico: neoclassical in style with devices and features from imperial Rome. Mission Santa Ines was the 19th California mission founded, in 1804. During its heyday in the early 19th century, it enjoyed bountiful harvests and kept thousands of livestock while serving a large Chumash Indian population. The mission has endured rebellions, social upheaval, neglect, and decay only to rise again through restoration and repair as the "Hidden Gem" of the California Mission chain. Today, the mission possesses a rich collection of paintings, statuary, vestments, manuscripts, and artifacts. The Santa Ines Mission Museum houses a collection of vestments, artwork, documents, and artifacts that were used throughout its history. The mission continues as an active church, offering services, religious education classes, youth groups, and community programs. Self-guided audio tours of the mission are available to visitors. Mission La Purisima was the eleventh mission founded, in 1787. Like some of the other mssions, it was largely destroyed by the earthquake of 1812, then rebuilt. A revolt of the Native Americans in 1824 cause numerous deaths and great disruption. After the secularization of 1834, the mission was left to fall into ruin. In 1845 the mission and all its lands were sold for only $1,100. In 1933 the property's owner donated the mission property and the surrounding area to the public. It is now the 966 acre La Purisima Mission State Historic Park. Today, ten fully restored buildings, with 37 furnished rooms, can now be seen as they originally appeared. Between 1769 and 1823, Spain's Order of Franciscan Missionaries founded a chain of 21 missions along the coast of modern day California on the El Camino Real, the coast highway of its day. The missions strengthened the Spanish presence in the new world while bringing Christianity, sometimes violently, to the native peoples as well as European trade and crafts. The era of the missions came to an end when Mexico achieved its independence from Spain, then transferred control away (the "secularization") from the Catholic Church in 1834. All of the missions have been to some extent restored and are mostly open to visitation today. Some continue to be working churches. Each brings alive the early history of California. Many also feature beautiful buildings and furnishings and displays of artifacts from the past.